Provide comfort for the family of Valerie Hadge with a meaningful gesture of sympathy. Of Belmont passed away peacefully January 22nd, 2019 with her loving family by her side at Beth Israel Deaconess Medical Center in Boston at the age of 77. Born on April 6, 1941 in Boston; beloved daughter of the late Toofy Wyshak and Georgette G. (Marchi) Wyshak. Valerie was raised in Watertown and moved to Needham after marriage and then to Waltham for 20 years before moving to Belmont in 1999. A graduate of Watertown High School, Valerie was employed as a Sales Representative in the Bridal Industry for years and had worked at La Reine Bridal in Chestnut Hill and Waltham. Valerie was artistic in every sense. She loved crafting and elegant gift baskets, decorating Christmas Trees and for the holidays. She had an amazing talent to make everything look so beautiful. She had a strong faith in her God and was an active and devoted choir member at Saint John Demarcus Orthodox Church in Dedham. Valerie is survived by her devoted & loving children Andrea Saber of Medfield and Belmont Firefighter Christopher Hadge of Belmont, her step children Jeanne White of CA, William Hadge of Easton and Heidi Matthews of Hull, her cherished grandchildren Madison, Savannah and Sloane, her dear sisters Joyce Cahaly and her husband Richard of Falmouth, Donna Wyshak of Boston and Georgette Wyshak of Belmont. In addition she is survived by a niece and two nephews who loved her dearly. Relatives & Friends are respectfully invited to attend Visiting Hours and the Funeral Service at St. John Damascus Orthodox Church, 300 West St. DEDHAM (off I95 south exit 17 for Rte. #135) on Friday Jan. 25th from 4-8 pm and again on Saturday Jan. 26th at 10:30am. Interment will follow at Fairview Cemetery in Hyde Park. 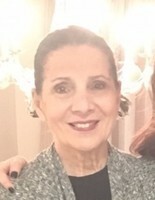 In lieu of flowers donations may be made in Valerie’s memory to St. John Damascus Church. To send flowers in memory of Valerie Lucille Hadge (Wyshak), please visit our Heartfelt Sympathies Store. Provide comfort for the family of Valerie Lucille Hadge (Wyshak) by sending flowers.